It’s difficult to imagine a house more connected to its landscape than this desert abode in Joshua Tree, CA. 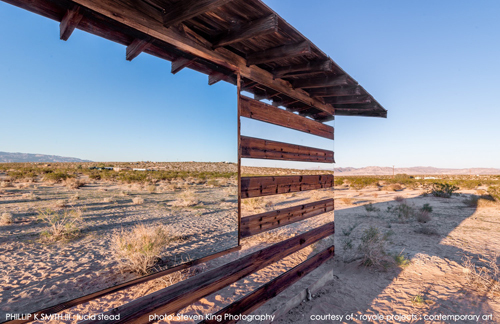 The project—called “Lucid Stead”—was the creation of Palm Springs, CA-based artist Phillip K. Smith III. 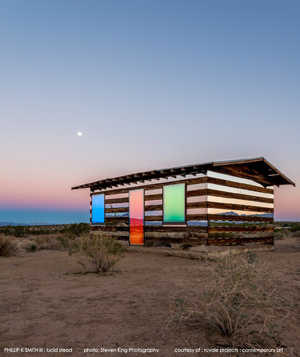 Artist Phillip K. Smith III’s project reflects the desert landscape during the day and shifts into a light exhibit at night. Lucid Stead is clad in mirrors that reflect the landscape during the day. At night, its doors and windows transform into a psychedelic collage of shifting neon-colored lights. The abandoned wooden homestead has been in the vast desert for around 70 years, according to project details. Using LED lighting, mirrors, custom-built electronic equipment, solar panels and other programming, the artist was able to reimagine the simple structure. Smith said he didn’t replace any of the building’s original materials, however, leaving a raw, natural feel to the building. Smith says the project is about tapping into the pace of the desert. You can view additional photos of the project here. “Lucid Stead is about tapping into the quiet and the pace of change of the desert,” Smith said in a statement on the project. Simple, yet profound, the unique project shows us one of the many brilliant ways architecture can interact with its surroundings. The project is now closed to visitors. So, they take one of the few good "dark sky" areas for observing the night sky and shine lights all over the place at night? After looking at some additional images, I find the daytime reflection effect very interesting and really a great art installation, but if you want colored lights at night in the desert - just go to Vegas. I retract my negative comment - it appears to be only on display for a couple of weekends. As a temporary installation, the lights are reasonable. Kudos for the reasoned retraction that would have been unnecessary had the article been more carefully written.